Sassafras is the common name and genus name for a group of deciduous trees in the flowering plant family Lauraceae, and in particular Sassafras albidum of the eastern United States. In general, three species are recognized, characterized by thick, deeply furrowed bark, tiny yellow five-petaled flowers, blue-black fruit, and three distinct leaf patterns on the same plant, with unlobed oval, bilobed mitten shaped, and trilobed leaves. There is an aromatic odor to the leaves, bark, and root. Sassafras (S. albidum) is particularly well-known for an essential oil distilled mainly from the root bark, which was once widely used to flavor root beer, as well as used medicinally and as a fragrance in perfumes and soaps. The plant also was used to brew a popular tea (sassafras tea). However, in the 1960s it was determined that the chief component of the essential oil, safrole, is a health hazard when internally, even in small amounts, and it has been banned as a food and flavoring additive in many countries, including the United States. Sassafras plays an ecological role as food for various animals, such as white-tailed deer and rabbits, and birds and some small mammals consume the fruits. It also is used as an ornamental tree and for its wood to make furniture. There are some other unrelated trees with the common name of sassafras outside of the Sassafras genus, including Oliveri cortex (black sassafras), Magnolia glauca (swamp sassafras), Umbellularia californica (California sassafras), and Antherosperma moschatus (Australian sassafras), among others. This article will be limited to members of the Sassafras genus. The genus Sassafras is part of the laurel family, Lauraceae, which comprises a group of flowering plants included in the order Laurales. There typically are three recognized extant species in Sassafras (Nie et al. 2007; FNA), native to eastern North America and eastern Asia. Sassafras trees grow from 15 to 35 meters (50–120 feet) tall and 70 to 150 centimeters (2.5–6 feet) in diameter, with many slender branches, and smooth, orange-brown bark. The branching is sympodial (a specialized lateral growth pattern in which the apical meristem is terminated). The bark of the mature trunk is thick, red-brown, and deeply furrowed. The wood is light, hard and sometimes brittle. All parts of the plants are very fragrant. The species are unusual in having three distinct leaf patterns on the same plant, unlobed oval (entire), two-lobed (mitten-shaped), and three lobed (three pronged; rarely the leaves can be five-lobed). They have smooth margins and grow 7 to 20 centimeters (2.75-8 inches) long by 5 to 10 centimeters (2-4 inches) broad. The young leaves and twigs are quite mucilaginous, and produce a citrus-like scent when crushed. The tiny, yellow flowers are five-petaled and bloom in the spring; they are dioecious, with male and female flowers on separate trees. The fruit are blue-black, egg-shaped, 1 centimeter (0.4 inches) long, produced on long, red-stalked cups, and mature in late summer (FNA). The name Sassafras, which was applied by the botanist Nicolas Monardes in the sixteenth century, is said to be a corruption of the Spanish word for saxifrage. Sassafras albidum (Nuttall) Nees - Sassafras, white sassafras, red sassafras or silky sassafras. Eastern North America, from southernmost Ontario, Canada through the eastern United States south to central Florida, and west to southern Iowa and eastern Texas. Sassafras tzumu (Hemsl.) Hemsl. - Chinese sassafras or Tzumu. Central and southwestern China. It differs from S. albidum in the leaves being more frequently three-lobed, the lobes having a tapered acuminate apex (not rounded to weakly acute). Sassafras randaiense (Hayata) Rehd. - Taiwanese sassafras. Taiwan. Treated by some botanists in a distinct genus as Yushunia randaiensis (Hayata) Kamikoti (Kamikoti 1993), though this is not supported by recent genetic evidence which shows Sassafras to be monophyletic (Nie et al. 2007). Popularly used in root beer, tea, medicinally, and other internal purposes for many years, scientists, beginning in the 1960s, learned that the chief component in the essential oil (sassafras oil) was a known carcinogen, safrole, with safrole carcinogenic in animal studies at the same concentrations (75-80 percent) used in the essential oil (Davidson 2005). Laboratory animals that were given oral doses of sassafras tea or sassafras oil that contained safrole developed various types of cancer or suffered liver damage. In humans, liver damage can take years to develop and it may not have obvious signs. The United States Food and Drug Organization (FDA) banned the volatile oil as a food and flavoring additive in 1960, and in 1976 it prohibited the interstate shipment of sassafras bark (Davidson 2005). Safrole is now recognized by the United States Department of Agriculture as a potential carcinogen. There are safrole-free sassafras extracts available. However, safrole, and sassafras not certified as safrole-free, have been banned in the United States as food additives or flavoring agents (FDA 2006). Sassafras leaves do not contain sufficient amounts of safrole to be covered by the FDA ban. Safrole is commonly used by clandestine laboratories to synthesize various hallucinogenic drugs such as MDA (3,4-methylenedioxyamphetamine), MDMA (Esctasy), and MDEA (Love). For this reason, the sale of safrole and sassafras oil is monitored by the U.S. Drug Enforcement Administration. Pure sassafras oil is highly toxic, with reports that a little as one teaspoon taken internally can kill an adult and a few drops can kill a toddler (Davidson 2005). Safrole has been determined to be potentially hazardous at 0.66 mg/kg of a person's body weight, which is an amount less than the dose found in sassafras tea (Davidson 2005). Steam distillation of dried root bark produces an essential oil consisting mostly of safrole that, prior to its being determined to have harmful effects, was once was extensively used as a fragrance in perfumes and soaps, flavoring for food (candy, sassafras tea), and for aromatherapy. The yield of this oil from American sassafras is quite low and great effort is needed to produce useful amounts of the root bark. Commercial "sassafras oil" generally is a by-product of camphor production in Asia or comes from related trees in Brazil. Acids can be extracted from bark for manufacturing perfumes. Sassafras oil is the preferred source of safrole, which is the main component (75-80 percent) of the essential oil (Kamdem and Gage 1995). The root or root bark is used to make tea, although most commercial "sassafras teas" are now artificially flavored as a result of the FDA ban. Root beer also is made from sassafra. Root beer is a traditional soft drink beverage carbonated with yeast, which owed its characteristic odor and flavor to the sassafras extract. Most commercial root beers have replaced the sassafras extract with methyl salicylate, the ester found in wintergreen and black birch (Betula lenta) bark. A safrole-free sassafras extract is now available for flavoring. The dried and ground leaves are known as filé powder. Filé is a spice still used for thickening sauces and soups in Cajun, Creole, and other Louisiana cooking, notably in the dish filé gumbo. Sassafras once was popularly used for medicinal purposes, with its use tracing to use as a folk medicine by Native Americans, who used it to cure many different disorders, but particularly as a spring blood tonic. Once introduced by Native Americans to European settlers, it became a sought-after plant in Europe with root bark and trees imported to Europe and sassafras tea (known as saloop) popular in London (Davidson 2005). Before its ban, sassafras was used as a diuretic, to treat urinary tract disorders and kidney problems, and to ease painful menstruation, and as a pain killer and antiseptic in dentistry. 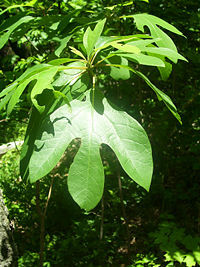 Externally, sassafras is still used to soothe eye inflammation and ease catarrh. The risks of external applications remain unclear (Davidson 2005). Sassafras was a commodity prized in Europe as a treatment (ineffective) for gonorrhea and syphilis (Horwitz 2008; Davidson 2005). Sassafras is often grown as an ornamental tree for its unusual leaves and aromatic scent. Outside of its native area, it is occasionally cultivated in Europe and elsewhere (France). The smell of sassafras oil is said to make an excellent repellent for mosquitoes and other insects, which makes it a nice garden plant. The wood of Sassafras albidum is dull orange brown, hard, and durable in contact with the soil; it was used in the past for posts and rails, small boats and ox-yokes, though scarcity and small size limits current use. Some is still used for making furniture (MP 2007). Sassafras leaves and twigs are consumed by white-tailed deer in both summer and winter. In some areas it is an important deer food. Sassafras leaf browsers include woodchucks, marsh rabbits, and black bears. Rabbits eat sassafras bark in winter. Beavers will cut sassafras stems. Sassafras fruits are eaten by many species of birds including northern bobwhites, eastern kingbirds, great crested flycatchers, phoebes, wild turkeys, catbirds, flickers, pileated woodpeckers, downy woodpeckers, thrushes, vireos, and mockingbirds. Some small mammals also consume sassafras fruits (Sullivan 1993). For most of the above mentioned animals, sassafras is not consumed in large enough quantities to be important. Carey and Gill rate its value to wildlife as fair, their lowest rating (Sullivan 2003). Davidson, T. 2005. Sassafras. In J. L. Longe, The Gale Encyclopedia of Alternative Medicine. Farmington Hills, MI: Thomson/Gale. ISBN 0787693960. Flora of North America (FNA). Sassafras. FNA Vol. 3. Retrieved January 13, 2009. Food and Drug Administration (FDA). 2006. US FDA/CFSAN: Listing of food additive status. United States Food and Drug Administration. Retrieved January 13, 2009. Francis, J. K. n.d. Sassafras albidum. U.S. Forest Service. Retrieved January 13, 2009. Horwitz, T. 2008. A Voyage Long and Strange: Rediscovering the New World. New York: Henry Holt. ISBN 9780805076035. Integrated Taxonomic Information System (ITIS). 1999. Sassafras Nees & Eberm. ITIS Taxonomic Serial No. : 18157. Retrieved January 13, 2009. Kamdem D. P., and D. A. Gage. 1995. Chemical composition of essential oil from the root bark of Sassafras albidum. Journal of Organic Chemistry 61(6): 574–575. Kamikoti, S. 1933. Neue und kritische Lauraceen. aus Taiwan I. Ann. Rep. Taihoku Bot. Gard. 3: 77–78. Missouri plants (MP). 2007. Sassafras albidum. Missouri Plants. Retrieved January 13, 2009. Nie, Z.-L., J. Wen, and H. Sun. 2007. Phylogeny and biogeography of Sassafras (Lauraceae) disjunct between eastern Asia and eastern North America. Plant Systematics and Evolution 267: 191–203. This page was last modified on 20 January 2009, at 02:48.